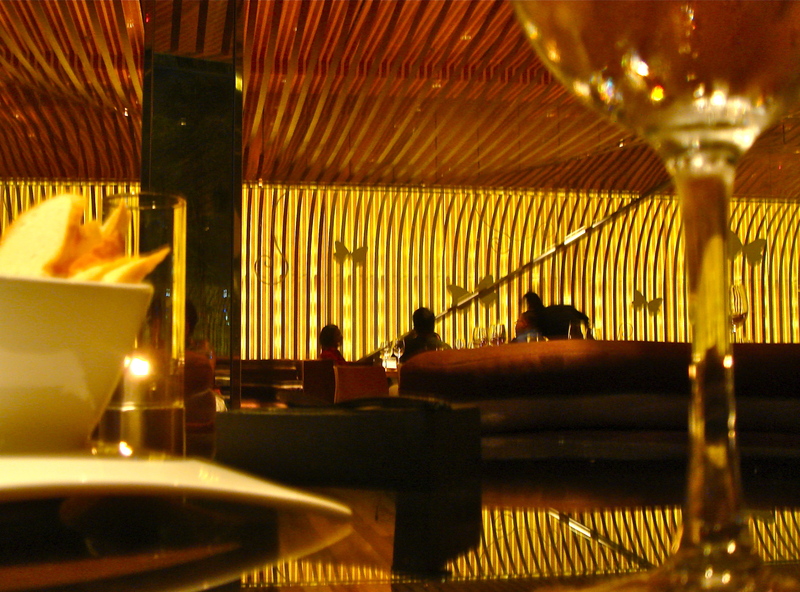 For a weekend, or three (or more) days of self-indulgence and excess, Kuala Lumpur beckons with every kind of luxury. 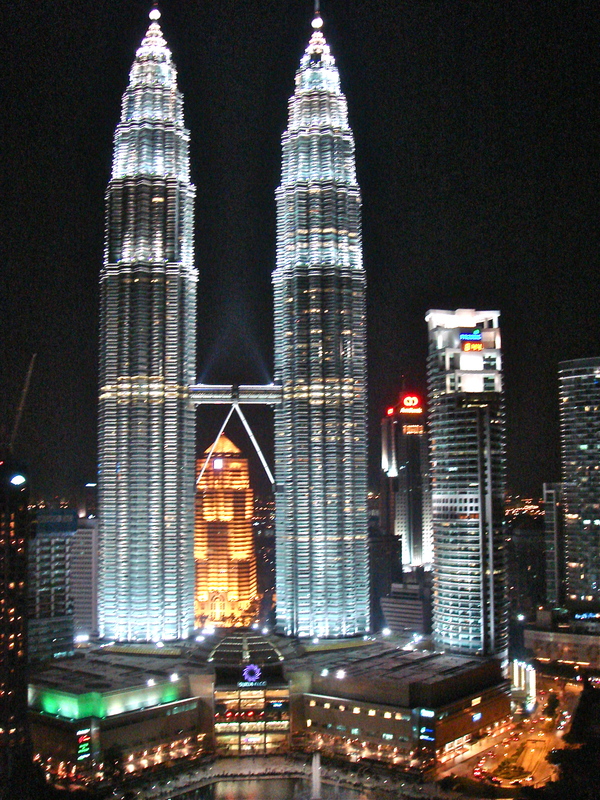 Thirty five minutes by air and exactly four hours, door to door, if your destination is the Kuala Lumpur City Centre; and it is dusk and you stand in awe beneath Cesar Pelli’s soaring, magnificently supple confection of steel and glass – the Twin Towers – still the tallest ‘twin’ building in the world. 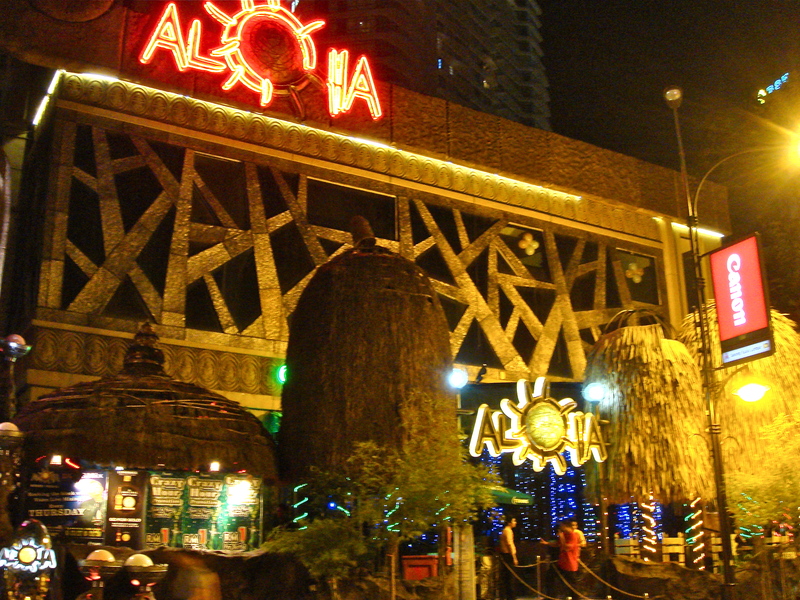 Neon, fairy-light-lit bars and nightclubs (Rum Jungle, Aloha, Beach Club Café, Oblique Club, Bar Ibiza et al) line Jl. P Ramlee around the corner. Music pounds, crowds crowd and young men and women flit around serving drinks or being served; everywhere, paper, cigarette butts, food. Strobe lights deliver a staccato, split image commentary and pipes in the ceilings gust huge bursts of smoke into the air in regular wheezes. The frozen margaritas, bar to bar, pack a potent punch. It is midnight, and the road is packed with vehicles, nose to fender, the pavements crammed with jostling humanity and beyond the myriad lights and the merry making is a man with a cart, a heap of corncobs and a makeshift grill – hot buttered, salted, freshly grilled corn on the cob. Wonderful. Past Rum Jungle, past Padi House, past huge machines pounding and splitting (resurfacing in progress), past tourists, foremen and workers, cigarette girls and cars, through the noise and jabberwocky of shouted greetings, laughter and other post-dinner midnight enjoyments. Kuala Lumpur is undoubtedly a foodie paradise. Each meal is a discovery accompanied by the (recurring) languid, rueful, passing thought fully fed up; enough now. Lebanese, Turkish and Arab cuisine abound; Tarboush (Jl. Bukit Bintang) serves a satisfying (if heavy) spread: fatoush, shish kebabs, lamb biryani, Lebanese bread, hummus, cheese with olives and olive oil. 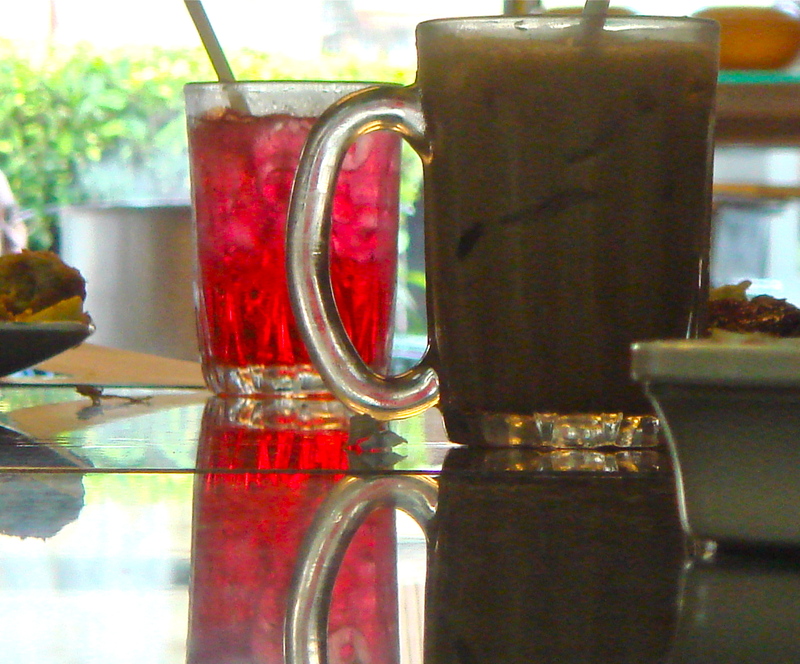 Guava juice with shaved ice, very sweet; and mahalabia, milk pudding Middle Eastern style. For great food and a perfect frozen margarita, head for Alexis Bistro & Wine Bar in Bangsar, Jl Telawi 3, cheek to jowl with Indian, Chinese and Malay, Japanese, Korean, Italian, Spanish, Vietnamese, Thai, European and American restaurants. For Afro-Portuguese take-aways and peri peri sauces – lemon and garlic, hot, hotter, hottest, it is Nando’s, KLCC basement. @ Madam Kwan’s (Pavilion / Suria KLCC), the nasi lemak and nasi bujari are flavorful and plenty; the fried chicken succulent, the sambal pungent, the rice perfectly cooked and the rendang melts in the mouth. The es campur is a fail – raisins, corn kernels, agar bits and beans at the bottom ? The British couple at the adjoining table lean across to discuss desserts – they too have es campur, along with something else made of sweet potato, coconut milk and other interesting things. For serious acoustics amplifying serious jazz, improvisational jazz, alternative sound and the country’s top musicians, enter a small door in a busy lane, step behind the curtain and welcome to No Black Tie bar and bistro; a stage, tables, a wooden staircase, and more tables one level above. Today: international recording artist, contemporary jazz pianist and composer Boy Katindig on synthesizer, Azmi Hairuddin on sax, Jordan Rivers on guitar, Fly on bass and Arthur Kam, all of seventeen, on drums. Jalan Alor – almost next door, a couple of minutes from swish Jl. 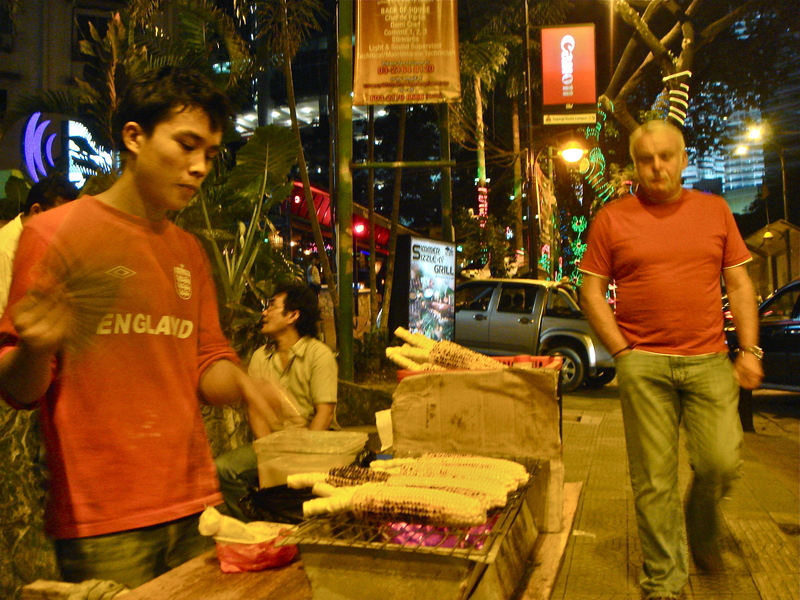 Bukit Bintang – is mamak (roadside stall) paradise. A throwback to the ‘muddy estuary’ (Kuala Lumpur in Malay) times of kampung (village) living, the overflow of tables line both sides of the long road (5.00 p.m. onwards, daily); hawker stalls, small restaurants with signs in Chinese and photographs of the dishes, red plastic chairs and gigantic bottles of beer, locals and expatriates, visitors and vendors, hot steaming food, freshly prepared, stands of fruit, barbecued meats, hanging ducks, frog porridge. The car inches through a diminished central aisle which is – at other times of the day – a road. 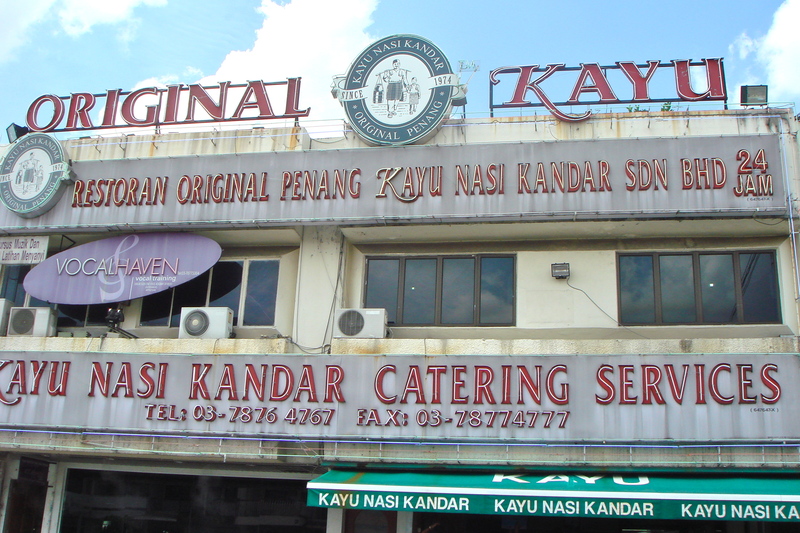 If you know someone in the know, which is to say, someone who is from KL and knows the ins and outs of local dining, you will be directed to Kayu Nasi Kandar in Petaling Jaya, reputably so famous for its local dishes, that it caters to ministerial and royal meals. The name is a throwback to the times when food was carried in baskets hung from a pole across a sturdy shoulder. The logo reflects a bygone era, and the hawker-stall experience is heightened by packed tables, orders called out in stentorian and overlapping shouts, numerous busy and harried waiters balancing food and the ceaseless business of serving and eating and clearing. Lassi (in many flavours) and nasi biryani from India, meat rendang from Indonesia, succulent fried fish, bitter gourd and long beans, fried king prawns, squid, chicken, fried, dried, korma, how you may want it … and then the es kacang, shaved ice, rose syrup, condensed milk, ice cream, palm sugar. Glorious. You leave, but the roaring business of cooking and frying and eating continues. QBA (read Cuba) in The Westin Hotel on Jl. Bukit Bintang is much vaunted and talked about; the Latin grill, wine bar, cigar lounge, courtyard and bar to see and be seen in. It is meat, meat and more meat – and then some more. The priciest meal of our KL food debauchery, it had the worst service, poorly cooked food, and worse, drifting odors from a nearby malfunctioning ‘restroom’ … a definite will-not-return experience that runs contrary to all of its web accolades. Teeq Lounge & Brasserie, Rooftop, Lot 10 Shopping Centre, 03–2782 3555, is worth a visit for its décor and friendly waiters, if not for its food, a fusion of Thai, Western and Japanese dishes. This rooftop experience comes with an unexpected view (apart from the rooftop views of Kuala Lumpur) – the glass fronted fitness club across the rooftop lawn, energetic Bollywood dancing classes in the upper and lower floors, more glass fronted rooms packed with bods and testosterone dripping musculature. And adjacent, the Rootz Club, the disco affiliated to Teeq. Presumably, once you have made it to the rooftop, you can train, you can eat, then you can dance. twenty.one kitchen + bar has panache; the asparagus risotto, fettucine vongole and roasted breast of chicken examples of their passionate plates; their drinks mixed and muddled, shaken and stirred. Marmalade (Bangsar Shopping Arcade) is a pleasant pit stop, the décor modern minimalism; the coffee, excellent. My teenager empties sachets of brown sugar onto the tabletop and traces out the word LOL. I photograph the sugary injunction, now the wallpaper on my Blackberry; a happy memory of a boy with not a care in the world (ostensibly) and the time to create instant messages from sugar. Every time I look at my phone, I am cheered. Street level alfresco dining ‘redefined’ at Jl. Pinang @ 7atenine is a surreal pavement experience under twinkling blue fairy lights. Gauzy white curtains billow, industrial fans whoosh blasts of cold air and tonight, techno-Indian pounds the speakers – a DJ, a tabla artiste and a sitarist, all together all at once. Try the crème brulee scented with pandan, with yuzu ice cream. Yuzu ice cream ? 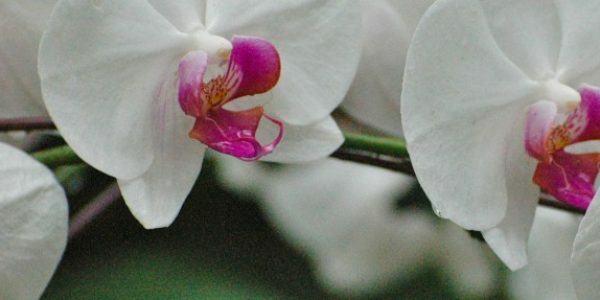 It is its name, says a brightly smiling waitress; it is pandan, says the waiter setting the dish on the table, pandan with panilla. Yuzu, aka vanilla ice cream ? I google yuzu (after the fact); it is a variety of citrus fruit. A visit to a recommended spa is both a welcome break and a breather. The somnolent seduction of Khareyana Spa is Bali revisited for the languor, the ease, the gentle touch, wood and stone, glass and water, fish and frangipanis. Ibu Zam and her five masseuses from Sulawesi suggest exotic applications – Mallika Splendour, White Hibiscus, Javanese Rose; lulur (Balinese traditional scrubs), oils, massages, warm showers, lotions, potions, more massage, more warm showers, more lotions … hot ginger tea and slices of watermelon. 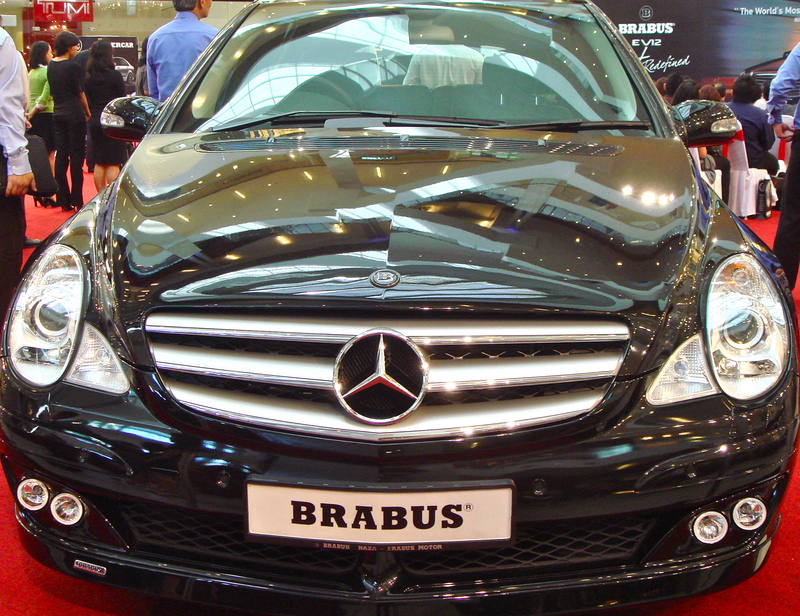 Malls abound with brands and merchandise, even red carpeted stairs … and in the atrium of The Pavilion, the Brabus, the high-performance aftermarket tuning company which specializes in customizing Mercedes Benz cars to owner specifications is unveiling its newest model, the EV 12, and if you want to know the price, then this car is not foryou.